Where is All this Investment Demand Coming From? HomeBusinessWhere is All this Investment Demand Coming From? Although there are some who continue to worry that the Fed’s massive liquidity programs will ignite consumer inflation, I continue to view this as a very low risk. Consumers just aren’t spending enough. But that isn’t to say that the current level of money growth can’t have serious consequences. Instead of excess liquidity flowing into consumer spending, it could flow into the capital markets, creating new distortions. Today, as the 10-year Treasury is hitting 3.29% at the same time the Dow hitting new year-long highs, you have to ask, where is all this investment demand coming from? Is it a bubble? Maybe we don’t have too many dollars chasing too few goods, but maybe we do have too many dollars chasing too few investments. But here is an interesting caveat. The chart below shows mutual fund flows for the last three years. 2009 is YTD with no adjustment. Bonds are blue, stocks are yellow and “hybrid” funds are green. 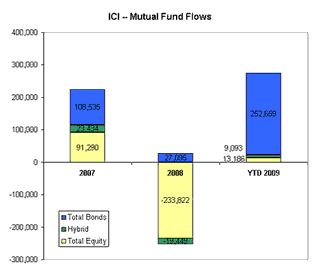 In 2007, we had total flows of $223 billion, 41% of which went to equity funds. Then we have the panic year of 2008. Investors pull $226 billion from mutual funds, all most all of which comes from equities. It looks from this chart as though retail investors pulled money from stock funds and left the proceeds in cash, thus creating the much ballyhooed mountain of cash. But the month-by-month flows tell a different story. Here we see fund flows month-by-month among bond fund types. For the first 9-months of 2008, there was a healthy $90 billion flow into bond funds in total. That’s slightly ahead of the $108 billion pace of 2007. But in the last 3 months, investors pulled $63 billion from bond funds, adding to their cash hoard. Now on to 2009. So far this year investors have added virtually nothing to equity funds. There is no mania there, at least not when it comes to retail mutual fund investors. Now there is significant variation month-by-month. In the first three months of 2009, investors withdrew $40 billion only to add $53 billion since. But even there, it doesn’t look like a mania at all. Over the last 6 weeks, there have been $4 billion in net redemptions. Even the $53 in net purchases over the last 6-months seems paltry compared with the $233 billion in redemptions last year. 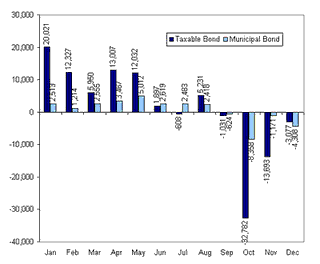 By contrast, take a look at bond funds. Fund investors have made net purchases to the tune of $253 billion so far this year. That is just about double the last two years of net purchases combined. And unlike stocks, bond investors don’t have any need to “catch up.” If anything, mutual fund investors would seem to have come into 2009 over weighted in bonds. Not only did mutual fund investors redeem $233 billion in equity funds in 2008, those same funds plunged in market value during the year. If retail investors followed any kind of rebalancing discipline (no laughing back there anyone who deals with retail investors… I said “if”), there would be the need to redeem bond funds and buy stock funds. Right now the opposite is happening. So it makes one wonder. If there is a bubble, isn’t it more likely in bonds? If there is an asset class that is getting more than its fair share of the excess liquidity, it isn’t stocks. Its debt.